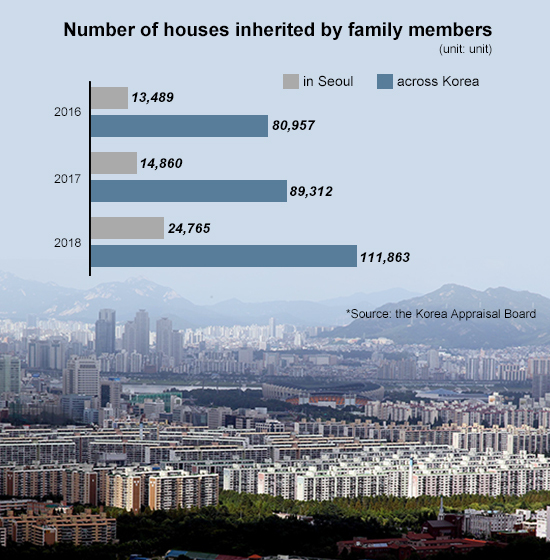 Hefty property-related taxes in South Korea have forced rich people with multiple properties to inherit a record high number of estates to their children or spouses, government data showed. According to data compiled by the Korea Appraisal Board on Monday, the number of houses inherited by family members across the country rose 25.2 percent on year to total 111,863 last year. Of the total, 22.1 percent or 24,765 were houses located in Seoul, up a whopping 66.7 percent from a year earlier. The surge in property inheritance follows after the Korean government has introduced a slew of strict regulations to rein in runaway housing prices since 2017. Under the toughened guidelines, the government last year proposed to double taxes on owners of two or more homes in hot zones including capital city Seoul and its surrounding areas, as well as Sejong and parts of Busan. The increase in comprehensive real estate taxes has added financial burdens to multi-home owners as the government also warned to up taxes on gains from property sales starting this year. The maximum tax to be levied on the gains from house sales in Seoul is set at 62 percent of the profit for people having three or more homes and 52 percent for those with two. But because those with only one house would be imposed with much lower taxes, house-rich people have rushed to reduce the number of properties last year by inheriting estates to their children or spouses, which would sharply help them save house-related taxes.